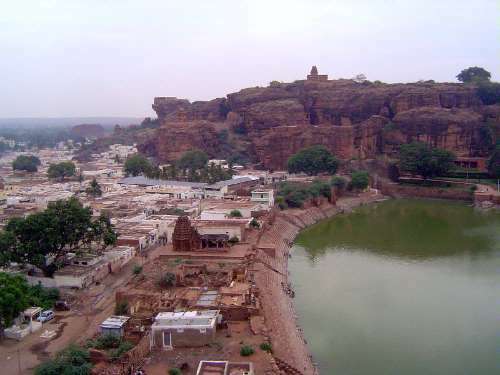 Badami, a hundred kilometers northeast of Hubli, is the ancient Vatapi, the capital of the Early Chalukyas. Not a familiar name? True, but in the 7th Century, and after the decline of the great Gupta Dynasty, South Asia was divided largely between three powers: the Cacas in the Indus Valley, the Pusyabhutis in the Ganges Valley, and the Chalukyas in the Indian Peninsula. 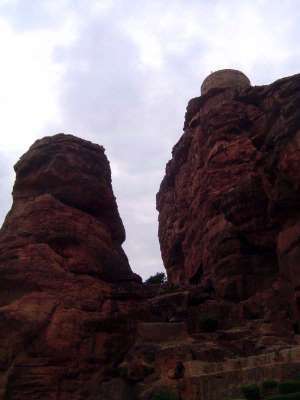 From Vatapi, now Badami, the Chalukyas for about a century and a half ruled the peninsula coast-to-coast. 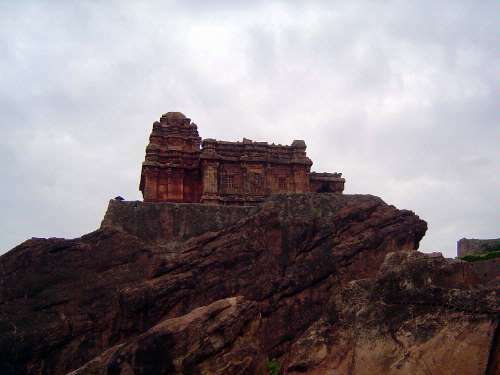 Pulakesin I, the first Chalukya King, made a fortress atop this sandstone outcrop, which became the nucleus of his capital. A dam created the Bhutanatha Tank, named for the Bhutanatha temple at the far side of the water. 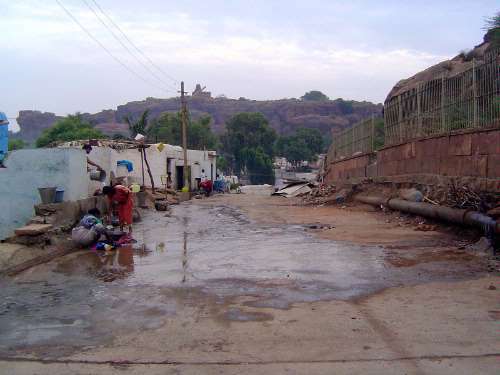 The tank is also called the Agastya Tirtha, a place of pilgrimage to the sage Agastya. 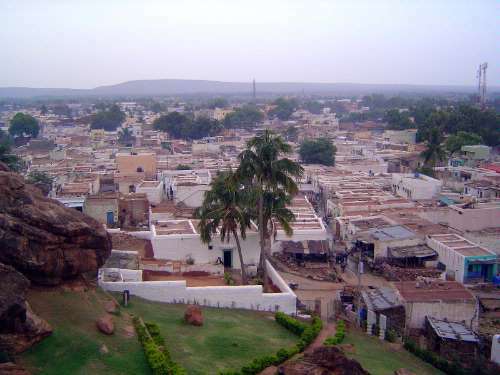 Modern Badami is a small town with plenty of people living lives not far removed from village life. The lawn indicates a site protected by the Archaeological Survey of India. In this case the site is a spectacularly situated temple. Here it is, from about the same spot as the previous picture. It's the Malegitti Sivalaya, the Shiva shrine of the female garland maker. 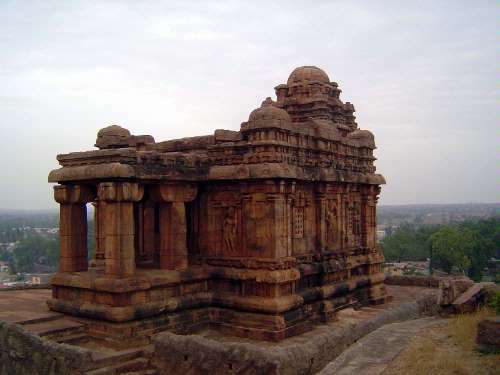 This is a 7th Century building, with the characteristic roof of a Chalukya temple, tiered with a massive crown instead of the parabola familiar from places like Khajuraho. 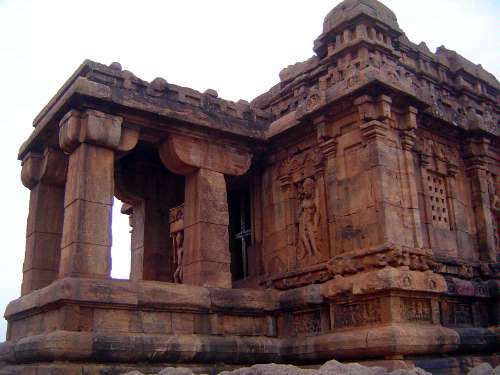 The porch is very simple, with four massive columns, but the temple proper is more ornamented. A view from above. A spire or finial was once atop the almost hemispherical summit. The figure is unknown but may represent royalty. 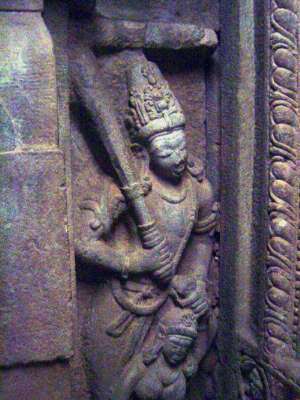 Again uncertain, but perhaps Vishnu as Keshava killing the demon Kesin. That was the supposition of Henry Cousens, author of The Chalukyan Architecture of the Kanarese Districts (Archaeological Survey of India, volume XLII, New Imperial Series, 1926, p. 54). Later authors repeat his suggestion. 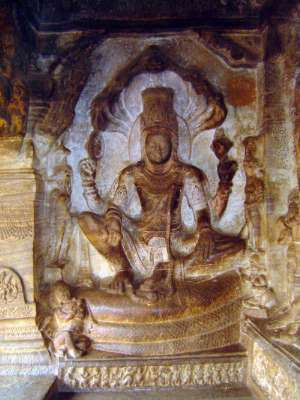 On the south side of the temple, Vishnu holds a wheel and conch. 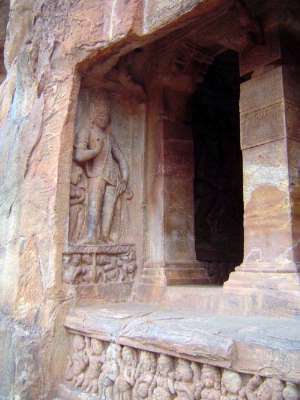 Cousens points out that it's very unusual to see a naked Vishnu, but this temple not only has one but has a matching one of Shiva on the other side. We're on our way back to the south side of the lake. 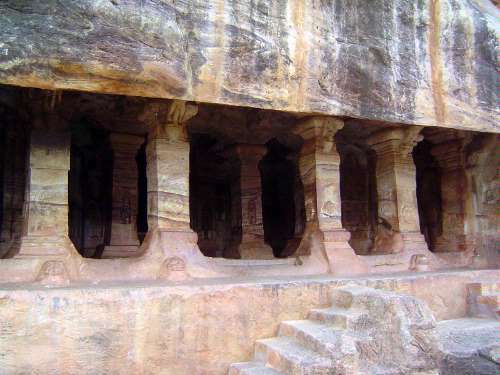 We're looking for a series of rock-cut temples in the cliff on the south side of the water. Here's a pretty fair sense of that south ridge. 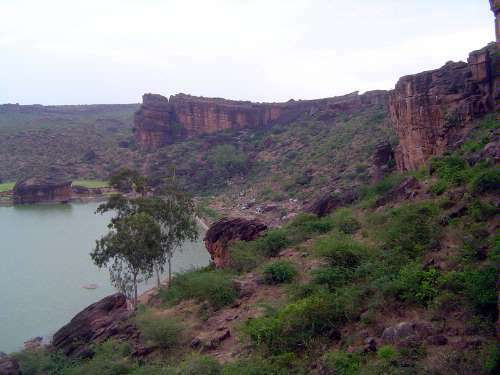 It forms a natural fort called the Rana Mandal and presumably is what attracted the Chalukyas to the site. 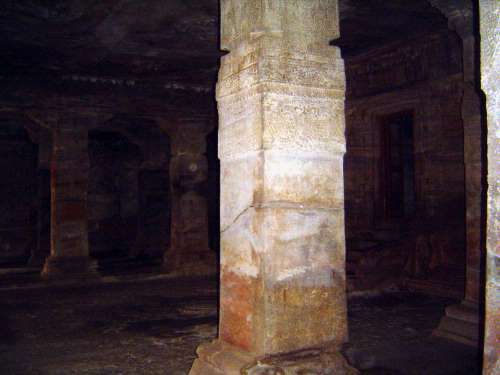 The first temple or cave, a Shiva temple from the 6th Century. 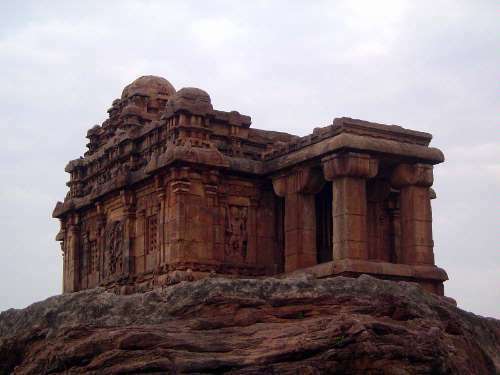 The Kannada name for these temples is Mena Basidi, apparently a corruption of megan basidis,, "temples above." 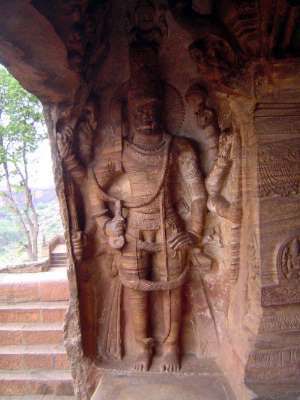 A guardian figure or dvarapala. He holds a trident or trisula. 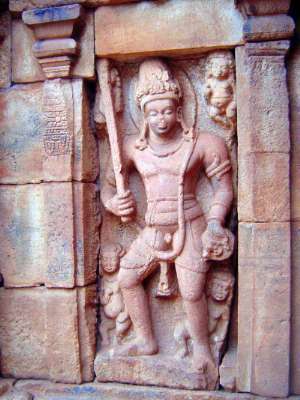 Under him, a bull fights an elephant; above him, there's a naga deity. 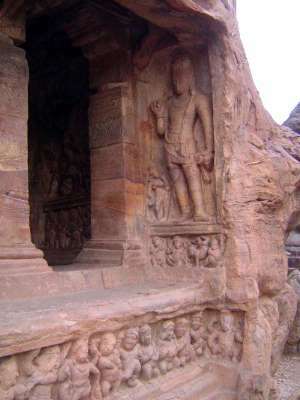 The most complete description of these caves is Basreliefs of Badami by R.D. Banerji (Memoirs of the Archaeological Survey of India No. 25, 1928). 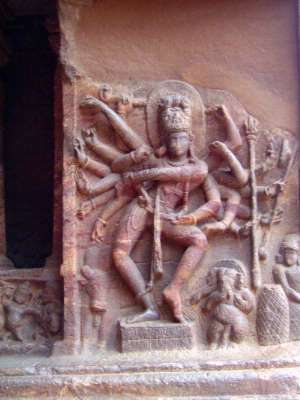 Shiva dances the Tandava, the dance signalling the destruction of the world. He has 18 hands, most with iconic objects including the dmaru, japamani, pushpa, trishula, and veena. 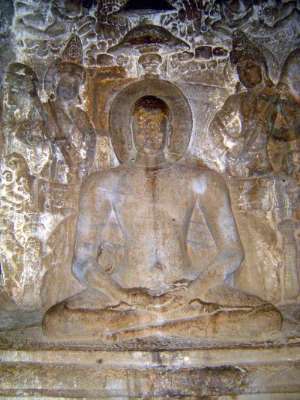 Some of the hands are in positions familiar from Buddhism. The abhaya mudra indicates protection, for example, and the varada mudra indicates blessing. 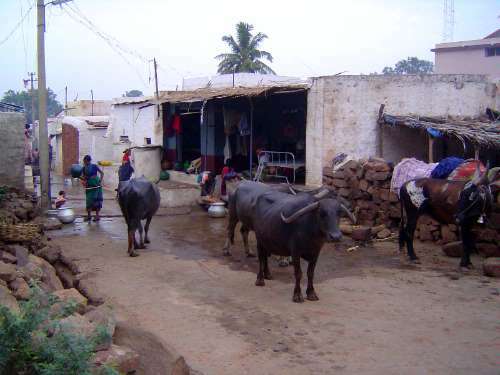 On the left, Nandi watches. At the lower right, Ganesh dances along. 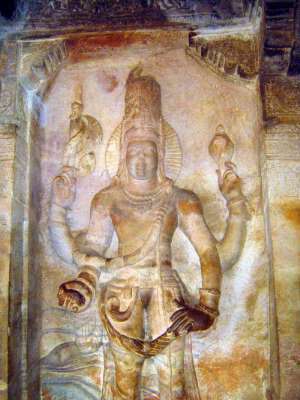 Harihara: a combined figure, half representing Vishnu and half representing Shiva. 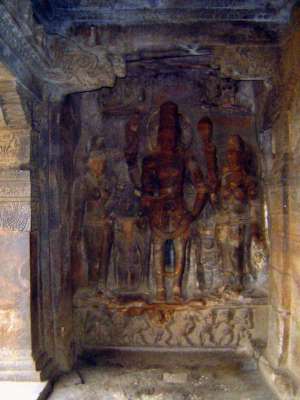 Nandi is next to the Shiva half; a cross-armed Guruda is next to the Vishnu half. The consorts are here, too, with Parvati for Shiva and Lakshmi for Vishnu. The combined deity may suggest the unity of god. Ardhanarisvara, a combination of Shiva and Parvati intended perhaps to bring comity between devotees of Siva and Sakti. Shiva is on the left, Parvati on the right. 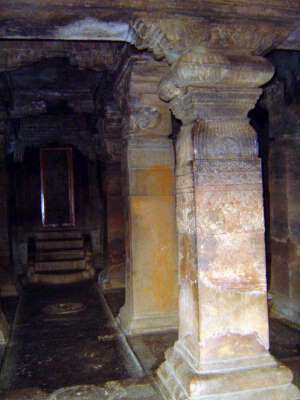 Nandi stands on the left; to the left of Nandi is the skeletal Bhringi, a worshipful devotee of Siva. The columns supporting the roof are carved with garlands; Nandi faces the innermost shrine. 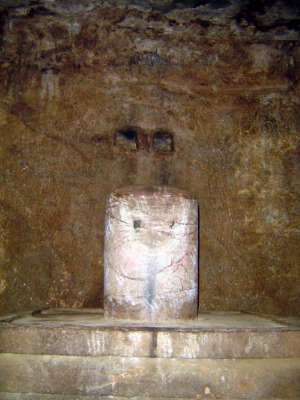 Inside that temple is this simple lingam. The temple is no longer active. 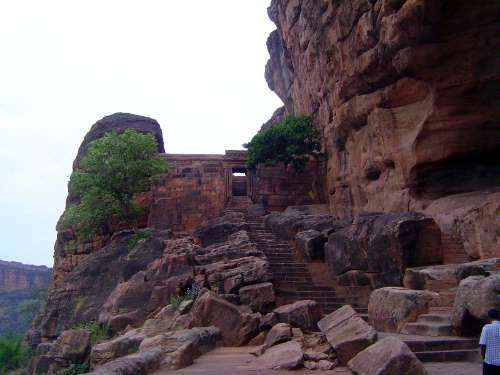 Stairs to the second cave. 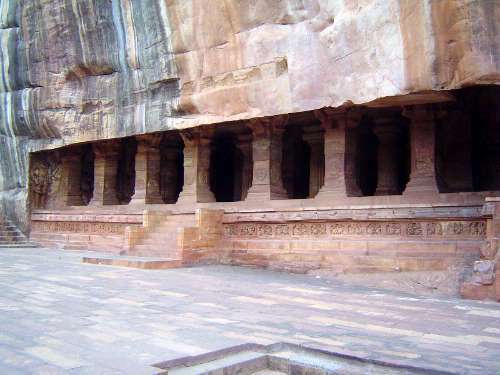 Cave Two was originally a Vishnu temple. Again there are dvarapalas or doorkeepers. 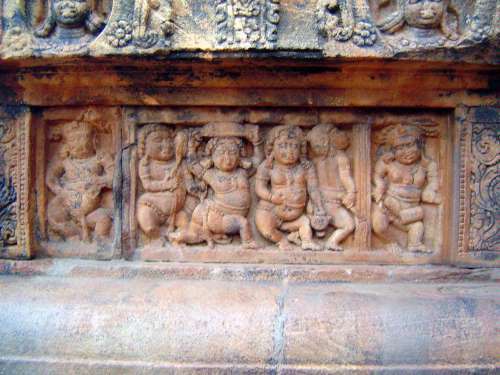 The temple floor is supported by dwarfs (ganas). The crude steps are recent and mask part of the frieze. The ganas under the Dvarapala are especially acrobatic. The depth of the cave. We've moved on to the next cave. (There's a numbering problem here. 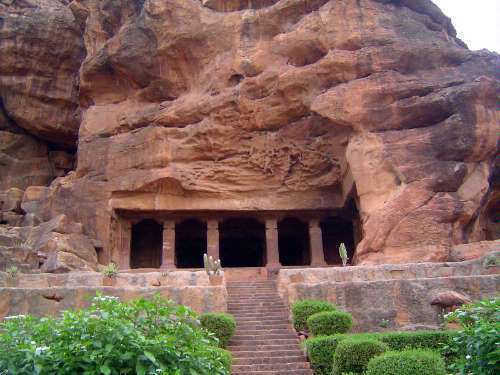 The cave in this picture is called Cave 3 by most guides but Cave 4 by Banerji, who counts a natural cave between this and the previously shown Cave 2.) 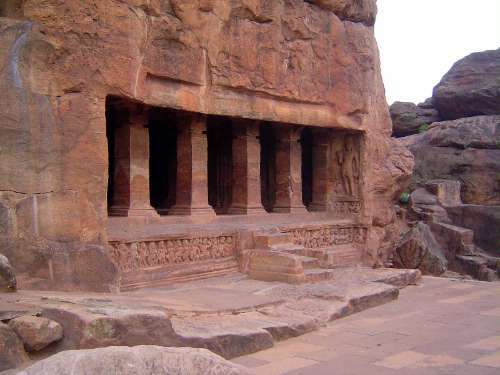 This cave in any case is famous in the historiography of ancient India because an inscription on one of the veranda pillars was used in 1874 to date the cave to the reign of "the glorious Mangalesa, the favorite of the world" and, more precisely, to 578 A.D. From that anchor the dates of many other events of the era have been calculated. 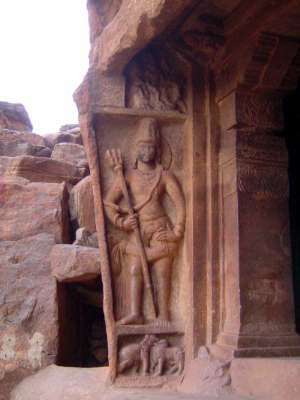 The doorway guardian is Virata-Purusha, an eight-armed Vishnu carrying on his right a wheel, arrow, mace, and sword; on his left, he carries a conch, shield, and bow. One arm rests on his leg. 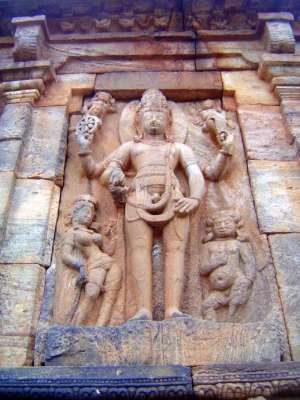 Trivikrama, an avatar of Vishnu. The story is that Vishnu appeared as a Brahmin before a demon named Bali and asked for the land he could embrace in three steps. The wish was granted. Bali's wife washed Vishnu's feet with water from the Ganga. (She is shown with her waterpot at the lower right here). Vishnu then rose to colossal size, one foot covering the earth while the other reached the sky. One of Bali's soldiers tries to push him down; others attack from above. Not a chance. 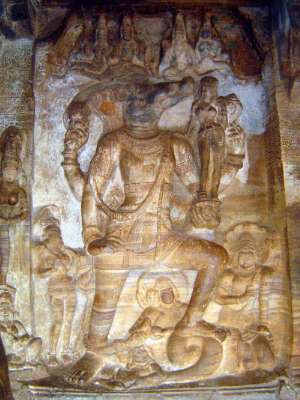 Vishnu seated (in the maharajalila posture of Buddhist iconography) on the great serpent Adisesha, whose five heads flare behind him as an umbrella. A small but clearly winged Garuda sits at the lower left. 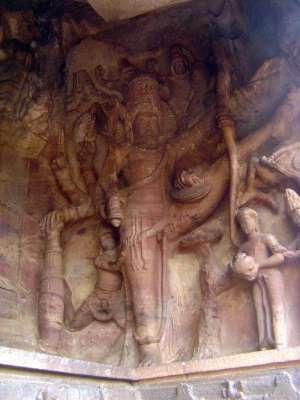 Varaha, the boar-headed avatar of Vishnu, tramples on a serpent and holds in his hand the earth goddess Bhumidevi, whom he has just rescued from the cosmic ocean (ekarnava into which the giant Hiranyaksha had thrown her. She had prayed to Vishnu for rescue, and he came, though the battle to save her took a thousand years. The story might be intended in this case to suggest that the Chalukya kings rescued their kingdoms from chaos. Narasimha, another avatar of Vishnu, this time as the man-lion that defeated Hiranyakasipu, brother of the giant defeated by Varaha. Hiranyakasipu could be defeated neither by man nor beast, but Narasimha was neither. 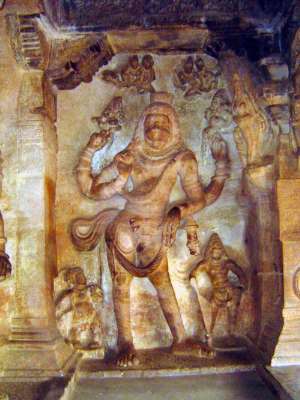 Worse luck for Hiranyakasipu, whose entrails were removed by Narasimha's claws. 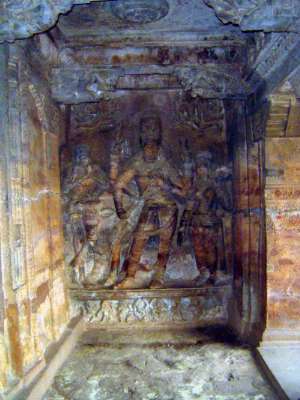 Another Harihara; Shiva on left, Vishnu on the right. 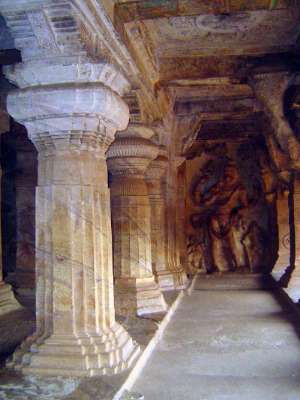 The columns are elaborately carved, more so than in any Indian cave temple except the Kailasa Cave at Ellora. The back of the cave is much simpler. 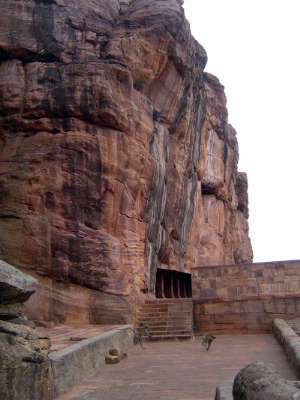 The cave seen from the east. Monkeys gambol. 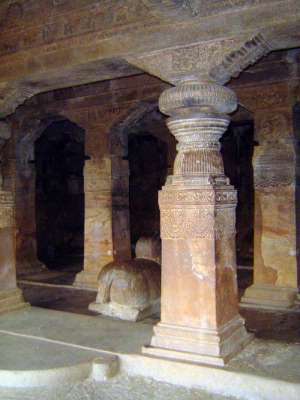 The next (by most counts, the fourth) cave is a Jain Temple. The entrance is comparatively simple. 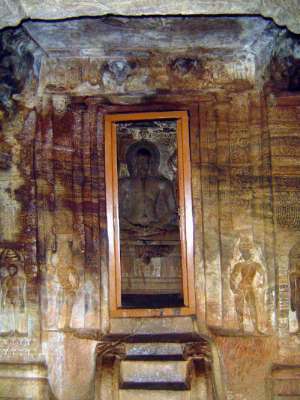 The sanctum is dedicated to Adinath, the "first lord" or first of 24 Tirthankaras, "ford-makers" or conquerors in Jainism. 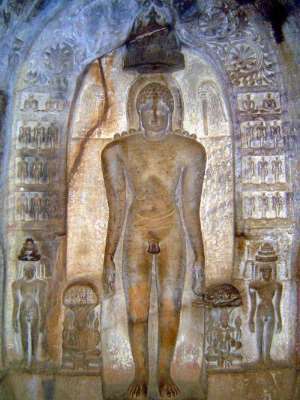 Mahavir, last of the 24 Tirthankaras, stands outside the sanctum. Spirit is what counts, not appearance. Hence his nakedness.